Late blight alert map for July 28, 2010. This week, late blight was confirmed in gardens in New York’s Chenango and Livingston Counties. If you’d like to stay up to date on where late blight has been detected, check out the new Late Blight Alert blog. Abby Seaman, WNY Vegetable IPM Educator with the New York State Integrated Pest Management Program, updates the blog weekly, reporting if and where late blight has been confirmed in New York and contiguous states and provinces. She also includes links to other late blight resources, including instructions for what to do if you think you might have it in your garden or on your farm. 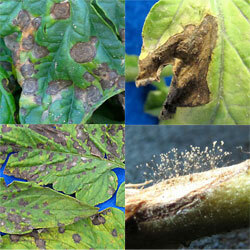 Late blight diagnosis can be difficult for those of us who aren’t trained plant pathologists. To help, Meg McGrath, plant pathologist at the Long Island Horticultural Research and Extension Center, has developed a Late blight ‘imitators’ page that compares late blight with several other common diseases that might be mistaken for it. Visit McGrath’s late blight photo gallery and other late blight resources. Department of Horticulture vegetable specialist Stephen Reiners (left) role-plays a grower who thinks his leafless peas were damaged by herbicide. Turns out the particular variety of pea he planted has no leaves. See end of article for more images. 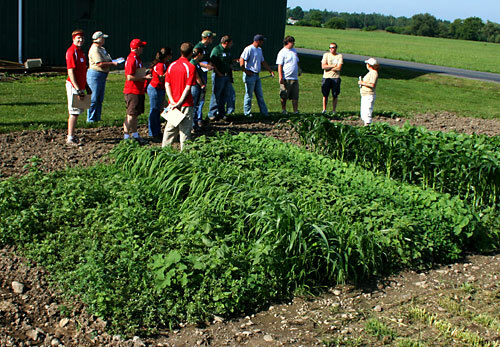 FREEVILLE, N.Y. – The staff members at Cornell University’s Thompson Vegetable Research Farm usually spend their summer killing weeds. But in one field this season, they planted them. 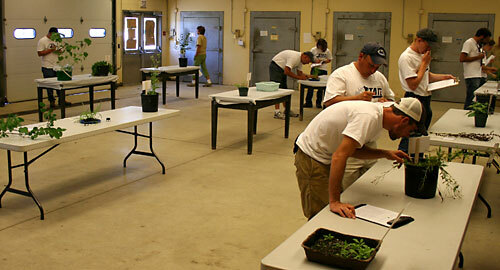 That’s because the facility was the site of this year’s Northeastern Collegiate Weed Science Contest, and the field served as a series of questions for the more than 100 students who gathered on July 27 to test their problem-solving skills and engage in friendly competition. “That’s the most competitors we’ve had in recent history – more than double what we usually get,” says Hilary Sandler, president of the Northeastern Weed Science Society, sponsor of the event. The students represented 10 schools from as far away as Florida and Illinois. Identified weeds, sometimes based only on their seeds or newly sprouted plants. In that specially planted field, sleuthed what herbicides had been applied to plots based on their effects on the crops and weeds. As is the tradition, the host school Cornell did not field a team. “With an event like this, there really is way too much of a home-field advantage,” says Robin Bellinder, weed scientist in Cornell’s Department of Horticulture, who along with Toni DiTommaso and Russ Hahn in the Department of Crop and Soil Sciences spearheaded the event. Other schools participating were Michigan State University, North Carolina State University, Pennsylvania State University, Purdue University, The Ohio State University, the University of Florida, the University of Guelph (Ontario Canada), the University of Illinois, the University of Maryland and Virginia Polytechnic Institute and State University. See also: Weeding Out the Competition in Cornell Alumni Magazine. 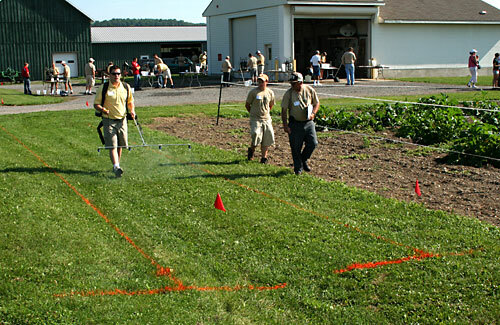 In a specially planted field, competitors prepare to determine which herbicides were applied based on symptoms displayed by crops and weeds. In the sprayer calibration competition, students demonstrate their skills in setting up equipment to deliver precise rates. Brian Caldwell, Department of Crop and Soil Sciences (center), plays a farmer who corn was damaged by geese. Students identified weeds, sometimes based just on the seed or newly sprouted seedling. The competition started with a written test. Alan Lakso, a professor of horticultural science, teaches the viticulture — or grape growing — side of the course. Kathy Arnink, a lecturer in food science, leads the enology, or wine appreciation and winemaking, portion of the course. “For me, I find the science so interesting,” she said. “It’s a beverage everyone can enjoy, and if you know more about the science,” it enhances the experience. The seventh annual Kathy Pufahl Memorial Container Design Competition was held July 20, 2010 at Cornell’s Bluegrass Lane Horticultural Research Facility, Ithaca, NY. Kathy (right), who founded Beds and Borders, Inc., Laurel, N.Y., was a staple on the horticultural educational seminar circuit, spreading her container ideas far and wide. It is her vision that changed the way the horticulture industry looks at the spring container business. Her influence brought back a bit of the art and beauty to the business. View the winners and other entries at the Cornell Greenhouse Horticulture website. After a full slate of presentations on campus in the morning, participants relocated to Bluegrass Lane for lunch and afternoon programs including perennial plant ‘walkabouts’ featuring University of Georgia expert and author Allan Armitage (below). 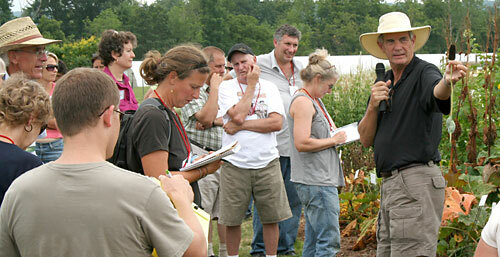 Allan Armitage leads perennial plant walkabout. Looking for something fun to do this weekend? Come to the Flower Open House at Bluegrass Lane, Saturday and Sunday 11 a.m. ­ to 1 p.m.! 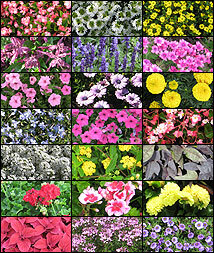 We have 1000+ annuals and perennials, so be sure to bring your camera. The gardens are not typically open to the public, so take this opportunity to see this hidden treasure. Feel free to share this freely with friends. Everyone is welcome. To preview the gardens, find us online at www.hort.cornell.edu/bglannuals/ and also on Facebook. More basil downy mildew images. Basil downy mildew – a new fungal disease that plagued commercial and home-garden crops in 2008 and 2009 – is again sending unlucky basil plants to an early grave in the Northeast this summer. By late June, the disease had already been detected in New York, New Jersey, and Ohio, says Margaret McGrath, plant pathologist at Cornell University’s Long Island Horticultural Research and Extension Center, Riverhead, N.Y. The first symptom that gardeners or growers are likely to spot is a slight yellowing on the upper surface of the leaves. Turning affected leaves over will reveal the grayish-purple (sometimes almost black) dusty growth of the pathogen’s spores. Removing individual affected leaves won’t stop the disease, since the spores are easily moved on air currents. McGrath suggests dropping everything when you first discover the disease on your plants, harvesting healthy-looking leaves, and preserving them as you usually would (by drying, freezing, making pesto, etc.) so you will have basil to enjoy later. Downy Mildew Wars – Article by McGrath in American Vegetable Grower. Post-doc research associate Cyd Hamilton and faculty member Jane Mt. Pleasant are instructors in the Cornell Prison Education Program and featured on the cover of this week’s Ithaca Times. Pick up a copy or read the article online. Done in by dandelions, foiled by milfoil, run over by clover? It’s time for the world series of weeds. 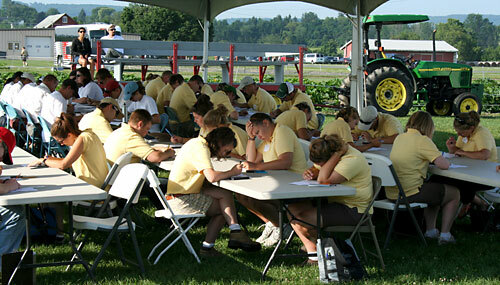 Cornell will host the 2010 Northeastern Collegiate Weed Science Contest July 27 at the university’s Homer Thompson Vegetable Research Farm in Freeville, N.Y. The purpose of the contest is to provide an educational experience for students in agricultural and environmental related fields of study who have a special interest in weed science. 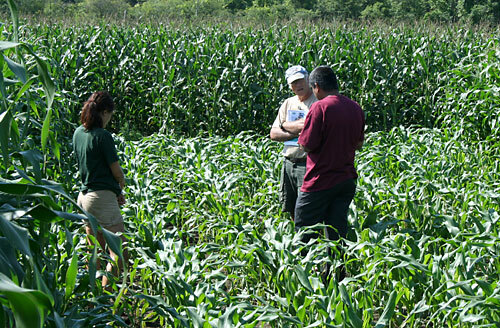 Undergraduate and graduate student teams participate in four contest segments: weed identification, herbicide identification, sprayer calibration and on-farm problems. A record number of students — 105 registered from as far away as Florida, Canada and the Midwest — are expected to attend this year’s contest. Institutions fielding teams in this year’s contest include: Michigan State University, North Carolina State University, Ohio State University, Pennsylvania State University, Purdue University, University of Florida, University of Guelph, University of Illinois, University of Maryland and Virginia Tech. The Northeast Weed Science Society and weed science faculty and staff in Cornell’s Departments of Horticulture and Crop and Soil Sciences are organizing the contest. An interview with Kevin Maloney, a Geneva-based research assistant in the Department of Horticulture, where cutting-edge research on apples is making the news. New episodes of Staff Notes premiere on Thursdays . 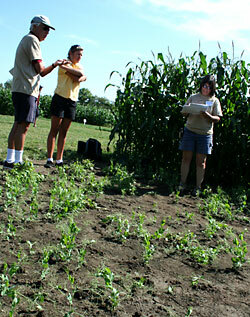 Also in the Staff Notes series at CornellCast: Krissy Faust tends to the wildflowers at Cornell Plantations. For Faust, spring is all about managing invasive species, like garlic mustard (Alliaria petiolata), which threaten plants in the wildflower garden. Do you want to learn how to use your forest for more than just firewood and timber? If so, join Professor Ken Mudge (right) at the MacDaniels Nut Grove, located in the Cornell Plantations Upper Cascadilla Natural Area, on Tuesday July 20, from 6:30-8:30pm. This hands-on workshop and tour will demonstrate how to inoculate logs to for mushroom production, show how to grow ornamentals in the forest, feature edible plants that can be incorporated into a forest setting, and show ginseng and goldenseal production in naturalized forest beds. Permaculture concepts are also being employed to reduce honeysuckle and channel waterflow down the hillside setting. All exhibits will be presented in a forest setting. The tour requires considerable walking and restrooms are not accessible. Participants should meet at the Library Annex parking lot on Palm Road south of Route 366 at the intersection with Caldwell Road. (See google map.) There is a $3 class fee per person or $5 per couple. Preregistration is required and space is limited. Reserve your spot by calling 607-272-2292.